In 1776, 56 men signed their names on a document that they knew might well mean their certain deaths as traitors to England. Standing on principles of faith and liberty, these men forged a powerful call for freedom and human dignity still resonating today in America. Yet, historical revisionists have distorted or attempted to wipe away every trace of this nation`s Christian heritage, including the heartfelt faith of these founding fathers! We need to arm our families with the TRUTH about the founding of our country and provide the knowledge to be able to authoritatively speak to those in your sphere of influence. The founders were prolific writers. We don’t have to wonder what they believed! It’s available to teach our families so we can be thoroughly equipped to spread the truth. It was never needed more than now. Our freedoms are eroding quickly, and we need to be able to have the wisdom to protect our the freedom we enjoy. So, let’s play a little game! 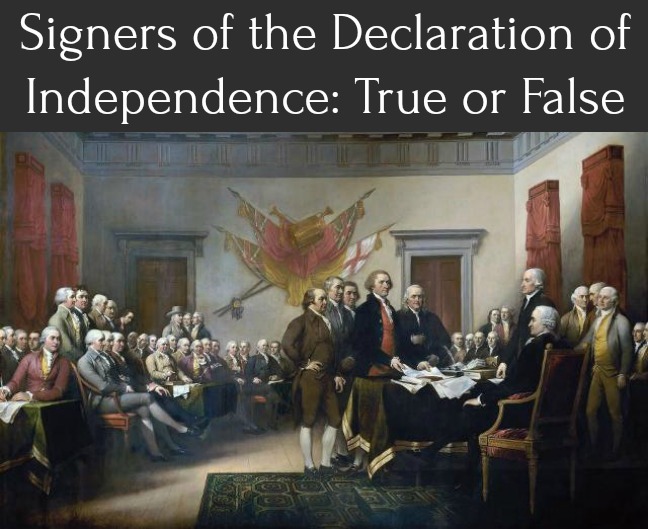 Here are 4 statements that you commonly hear about the founders of our country, specifically the signers of the Declaration of Independence. Do you know if they are true?